Our award winning service is renowned throughout the country as being one of the very best in the industry. With an A+ Rating from the Better Business Bureau, our service staff is sure to leave you feeling comfortable and more than pleased with their unwavering commitment to excellency. Should you choose to wait at the facility for your repairs to be done, you will be treated to a waiting room with free hot coffee, snacks and cold drinks, all while reading a magazine or watching the flat screen T.V. Pet Friendly! 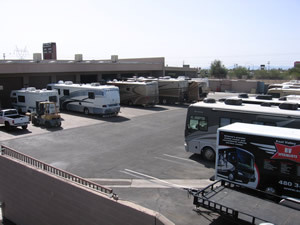 Serving the greater Mesa / Phoenix area, we offer a complete selection of top quality motorhome services and RV repairs for all makes and models of recreational vehicles. Services include but are not limited to recommended scheduled maintenance services, engine diagnostics and repairs, drive-train diagnostics and repairs, as well as brake services including machining of drums and rotors. 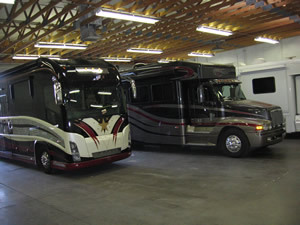 We also offer coach services such as diagnostics and repairs of electrical systems including inverters and generators. Diagnostics, repairs and replacing dash and roof air conditioning systems, as well as diagnosing, servicing, and replacing of all appliances. Some of the manufacturers we perform warranty service and repairs for are.